We’d love your help. Let us know what’s wrong with this preview of Blackboard by Lewis Buzbee. In Blackboard, Lewis Buzbee looks back over a lifetime of experiences in schools and classrooms, from kindergarten to college and beyond. He offers fascinating histories of the key ideas informing educational practice over the centuries, which have shaped everything from class size to the layout of desks and chairs. Buzbee deftly weaves his own biography into this overview, approaching his subject as a student, a father, and a teacher. In so doing, he offers a moving personal testament to how he, "an average student" in danger of flunking out of high school, became the first in his family to graduate from college. He credits his success to the well-funded California public school system and bemoans the terrible price that state is paying as a result of funding being cut from today's budgets. For Buzbee, the blackboard is a precious window into the wider world, which we ignore at our peril. To ask other readers questions about Blackboard, please sign up. I very much enjoyed Lewis Buzbee's personal history partly because so much of it reminded me of my own personal history. He went to school in middle class suburban San Jose beginning with kindergarten in 1965, and so did I. I didn't go to the same schools he went to, but we were only a few miles away, so I found his descriptions quite familiar. If this were just a big blast from the past, there would be limited appeal for the book, even from those of us who were there. Instead, Buzbee uses his o I very much enjoyed Lewis Buzbee's personal history partly because so much of it reminded me of my own personal history. He went to school in middle class suburban San Jose beginning with kindergarten in 1965, and so did I. I didn't go to the same schools he went to, but we were only a few miles away, so I found his descriptions quite familiar. If this were just a big blast from the past, there would be limited appeal for the book, even from those of us who were there. Instead, Buzbee uses his own school experiences as an average middle-class student in pre-Silicon Valley San Jose to compare the past he remembers with the current situation in American schools. Along the way, he also looks at the origins of some school traditions, such as reciting the pledge of allegiance, which until Franklin Roosevelt changed it during World War II, was recited with outstretched arm, palm down, uncomfortably like the salute being used in Germany at the time. As a beneficiary of the excellent public school system of the 1960s and 1970s, Buzbee (and I) recognize how lucky we were to have safe schools, competent teachers, ample supplies, and to be able to take it all for granted. Now the situation is different, and he and his wife never seriously considered sending their daughter to public school, which in the same state that was top in the nation back then, is now right at the bottom. He blames the beginning of the downfall with Proposition 13, which in 1978 severely reduced property taxes in for Californians. Do the people who vote against school bonds imagine that they will be unaffected by poor schools in their neighborhoods? Even if their own children go to private schools, they will still have to live with the consequences of a community that can't afford to educate everyone well. This book is a warm meditation on what it means to go to school, to get an education, and to give one. It's clear that the author actually think these things are synonymous. His description of how California went from a ranking in U.S. of number two when I as in school to number 49 today is a replay of the heartbreak I witnessed as the years went by and the lunatics on the right systematically destroyed most of what made California great in our lifetimes. I remember a high school officer telling This book is a warm meditation on what it means to go to school, to get an education, and to give one. It's clear that the author actually think these things are synonymous. His description of how California went from a ranking in U.S. of number two when I as in school to number 49 today is a replay of the heartbreak I witnessed as the years went by and the lunatics on the right systematically destroyed most of what made California great in our lifetimes. I remember a high school officer telling us that “these people got theirs, and don’t want to spend their money giving others the same benefits that they themselves enjoyed to get where they are”. I had no idea how right he was. Proposition 13 and the subsequent Reagan “tax revolution” very quickly set up the seeds of the destruction of the opportunity machine that California had created for us all, including immigrants Ronald Reagan from Illinois and Howard Jarvis from Utah (the Proposition 13 proponent). Buzbee, a native Californian from the Santa Clara (Silicon) Valley, walks us through the pedagogic structure, the sociology, and physical components of pre-school, Kindergarten, elementary school, middle school, high school, junior college, and the university. Having been in at least one of each of these in his lifetime, he uses a physical re-visitation regime to conjure his own memories of what going to school was like. I was startled and pleased to hear that, like my daughter, his daughter went to French American International School, which he spends a lot of time discussing in detail. This was great; he nailed the description of the school, and its benefits. The greatness of that school is unquestionable. However, it costs us about $25,000 a year, which means we had to make $35,000 in salary just to pay for it. Ask me if I’d have preferred to pay higher taxes and have great schools for everyone to be able to go to, including my kid. To paraphrase Buzbee paraphrasing Bush the father – “Read my lips – raise my taxes”, if the intent is to use them to cut class sizes in half, equip schools with enough materials so that teachers don’t have to buy them on their own, and pay teachers a six-figure salary so that they quit to get jobs selling cell phones to make a better living. Let’s do this soon, so that our children’s educational fate isn’t dependent on bake sales. Buzbee and I are both California natives, both San Franciscans, and have had similar education trajectories through the same kinds of school, right through to my time after I entered the workforce studying Design and Typography at night at U.C. Berkeley Extension. So my empathy for what he wrote here is probably higher than usual. But I think and hope that his observations and prognosis are universal. I loved this book because it made me realize in the most personal way possible that I was extremely fortunate to be raised in California and to receive the education I enjoyed at that time in recent history. Five stars; this is a great book. This is my third Buzbee novel. 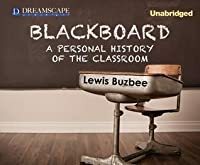 Buzbee both educates you on the history, structure and influences of the classroom in Blackboard, while he shares insights and first-hand experiences. You guys, this is a five star novel. I rarely feel compelled to write reviews (I've never felt I was any good at writing reviews so I usually skip them and put my stars in), but this novel deserves a spotlight on the Goodreads Soapbox. So, pardon me for a few minutes, to take the time to explain why I'm stepping out This is my third Buzbee novel. Buzbee both educates you on the history, structure and influences of the classroom in Blackboard, while he shares insights and first-hand experiences. You guys, this is a five star novel. I rarely feel compelled to write reviews (I've never felt I was any good at writing reviews so I usually skip them and put my stars in), but this novel deserves a spotlight on the Goodreads Soapbox. So, pardon me for a few minutes, to take the time to explain why I'm stepping out of my comfort zone to share my experience in reading Blackboard, with you. Buzbee has the innate ability to draw a line from his thoughts to my own, and he does this fluidly. Blackboard guides you into the past to re-encounter the hidden memories of your school days. It effortlessly reaches into your mind and pulls out the contents of a world where you once lived; a world that nurtured a sense of self and wonder. As with the first two Buzbee novels I read, I am left with a warm feeling in my stomach, as if I just drank a sweet mug of hot cocoa that whisked me up, into a cozy, familiar sanctuary. The sincerity and honesty that oozes from Blackboard will have you asking yourself why you haven't read more by this author (and you really should-I just ordered another book he's written). It may be contrived to say, but he has a way with words, and it's a beautiful, subtle, intelligent, enigmatic way (too much? Well, it's the truth). You follow Buzbee as he winds you through his personal history and education. As you hop in, it leads you into your own past to re-live the sweet moments of your childhood education. Blackboard reminds us how important that time in the classroom is for children, in coaxing us to remember how it has impacted and molded our own lives. I hope you have the pleasure of reading this gem and I hope it takes you back to uncover what shaped you and inspired you, as it did for me. Old memories resurfaced as I began to slide back into the past, all the tidbits of a time long forgotten sprung out of the caverns of my mind and into life. Lewis Buzbee is a talented writer and an even more exceptional human being. The depth in his writing serves as a small window into the kind heart and devotion that one Author has towards his Readers. You can feel the purpose in this novel; you can feel the respect. Buzbee puts a lot of trust in readers, and in doing so, the result is a brilliantly written novel that moves the heart and opens the once rusted, closed shutters of hope-filled dreams, and sweet memories. Vs. The teaching brain and Vs. Louise Ammended, book on education and memoir on flashy issue respectively, neither of which is greatly written. Blackboard isn't, either, written in a compelling style, or showing mastery of structure, but the topic is important, the view, solid, and I gather his ideas are correct. Thus, three stars. That is, good if you care about education. If don't, don't read (at all, maybe). "Allow me to digress again, schoolboyishly, aping Jonathan Swift. Here is my Immodest Vs. The teaching brain and Vs. Louise Ammended, book on education and memoir on flashy issue respectively, neither of which is greatly written. Blackboard isn't, either, written in a compelling style, or showing mastery of structure, but the topic is important, the view, solid, and I gather his ideas are correct. Thus, three stars. That is, good if you care about education. If don't, don't read (at all, maybe). -Without qualification, and immediately, halve the student population of every classroom, from forty to twenty, or from thirty-two to sixteen, it doesn’t matter. -Across the board, and immediately, double the salary of every public school teacher K–12. Except in the case of middle school teachers, grades six to eight: triple their salaries. -Use the current teaching pool to mentor the new crop of teachers that my plan requires. Let us also offer experienced teachers yearlong sabbaticals every five years, for professional development and to forestall burnout. -Build the required classrooms, and make all classrooms, new and existing, adhere to these specifications: They must be cool in the summer, warm in the winter; they must be overfilled with “educational materials,” including art and music and science supplies; they must be surrounded by vast playing fields. Spend far too much tax money on physical improvements. -Ensure that each student is fed both breakfast and lunch every single school day. -Ensure plenty of time for each student to stare out the window. Interesting for teachers and educators, not for me I don't quite remember what drove me to pick up this book, but it sounded interesting. The author takes us through a journey of his experiences in the classroom as both a student and teacher. We read about his teachers, his classmates, the rooms themselves, what he learned, etc. Then we read about his own experiences as a teacher. I have to say, I don't get the great reviews. I know it's what it says on the cover but wow his writing is tedious. Interesting for teachers and educators, not for me I don't quite remember what drove me to pick up this book, but it sounded interesting. The author takes us through a journey of his experiences in the classroom as both a student and teacher. We read about his teachers, his classmates, the rooms themselves, what he learned, etc. Then we read about his own experiences as a teacher. I have to say, I don't get the great reviews. I know it's what it says on the cover but wow his writing is tedious. Perhaps it's because I'm not extremely familiar with him I found I could not relate, did not care too much for his experiences and wasn't particularly interested in his suggestions. I read though them, understand where he's coming from and agree with most of them, but not having read the previous parts of the book meant this section had little to no impact on me. I got this book as part of the Goodreads First Reads program, and so had very little pre-conceived notions, other than this was a book about education, a favourite subject area of mine. I really enjoyed the beginning sections about elementary education, and the last few sections on higher education and the authors thoughts on improving education. I really loved how the author weaved his personal story into some history of education. I felt like I both learned something about the author and about I got this book as part of the Goodreads First Reads program, and so had very little pre-conceived notions, other than this was a book about education, a favourite subject area of mine. I really enjoyed the beginning sections about elementary education, and the last few sections on higher education and the authors thoughts on improving education. I really loved how the author weaved his personal story into some history of education. I felt like I both learned something about the author and about the history of education by the time I closed the last page. Most of us who have been teaching for some time need periodic reminders of the important work we’re doing in the classroom. It’s easy to become insensitive in our relations with our students and let automatic pilot take over. Also, since our salaries usually don’t reflect the value of what we do, the central role we have in students’ lives, it’s easy to stagnate. 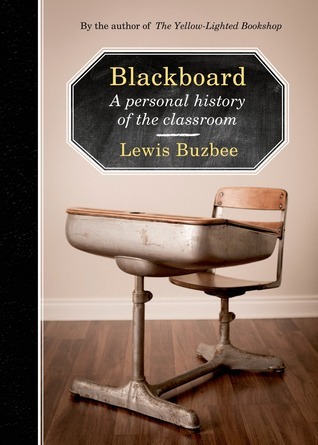 Being one of those teachers, it was uplifting to read Blackboard: A personal history of the classroom by Lewis Buzbee. A moving and th Most of us who have been teaching for some time need periodic reminders of the important work we’re doing in the classroom. It’s easy to become insensitive in our relations with our students and let automatic pilot take over. Also, since our salaries usually don’t reflect the value of what we do, the central role we have in students’ lives, it’s easy to stagnate. Being one of those teachers, it was uplifting to read Blackboard: A personal history of the classroom by Lewis Buzbee. A moving and thoughtful meditation on learning, the book underscores our value as teachers and the lasting impact we have on our students. Buzbee does a nice job of connecting the dots, too. Education is not a parent-of-school age-children issue, it's a societal one. Loved this thoughtful, well-written personal account of one man's journey through the public school system in California in the 1960s. Buzbee's appreciation for the many teachers who took the time to educate, inspire, and mentor him shines through each and every one of his sentences. What a shame that not all Americans have his experience, especially nowadays--"raise my taxes," Buzbee writes, so more students of today can have a rich educational experience like his. Lewis Buzbee, a writer and a teacher, has written sort of a history of education in America, based mostly on his own experiences in his own schooling from elementary through college and beyond. It was interesting to read but I really didn’t learn much from it, and I finished it feeling that I really wanted more. Lewis Buzbee goes on a trip down nostalgia road of all of his school experiences since elementary school. It takes the reader back to a time when the American educational institutions were actually effective. Interesting read. Sweetly nostalgic. What a good time of year to release such a book. Voice filled and fueled memoir of classroom, schools and education, with a dose of educational history and some family musings. LOVED this book. If you are feeling nostalgic about or grateful for education, you'll love it too! It's an interesting blend of memoir and history of education. Eh. Not exactly what I was expecting. A mash-up of the author's education and his development as a writer. Pick one. Focus. Elegant, heartfelt, nostalgic and intelligent.